Are you looking for a tasty way to add more grass-fed butter to your diet? 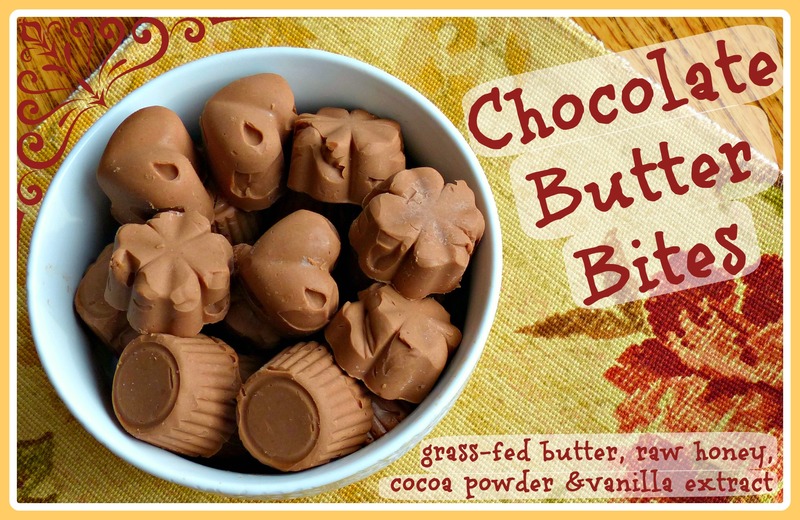 Try these chocolate butter fat bombs! I find these bite-sized morsels to be reminiscent of a a dark chocolate frosting. While I prefer to pop them into my mouth straight out of the freezer, I think this recipe would also make a lovely chocolaty spread for bread, muffins, etc. when stored in the fridge. First off, if you’re not sure why you’d want to go out of your way to eat more butter, check out this great post from Empowered Sustenance on why butter is a superfood. For maximum nutrients, I recommend using grass-fed butter in this recipe. Depending on where you live, you may have several different varieties of grass-fed butter available to you. Personally I exclusively buy Kerrygold butter because I can get it at my local Costco for a very affordable price. If you’re not a Costco member, you can also find grass-fed butter at health food stores like Sprouts, Trader Joe’s or Whole Foods. Local grass-fed dairies also often sell grass-fed butter, although that option is likely to be more expensive. I use salted butter for these mints because I buy my grass-fed butter at Costco and Costco only carries the salted variety. You could definitely use unsalted butter instead, just be sure to add some salt to taste. Allow butter to soften by leaving it out at room temperature for a few hours. (Or sticking it in a sunny place, or gently warming it in the toaster oven, etc.) You want it to be squishy but still solid. Add butter, cocoa powder, honey, and vanilla extract to your food processor or mixer. Process until all ingredients are evenly mixed. Spoon mixture into silicone molds, or simply drop spoonfuls onto a flat surface lined with parchment paper. Place in freezer until bites become firm (generally 30 minutes or so), then remove from molds or parchment paper. Store in the freezer or fridge. Enjoy! Looking for More Healthy Fat Bomb Recipes? 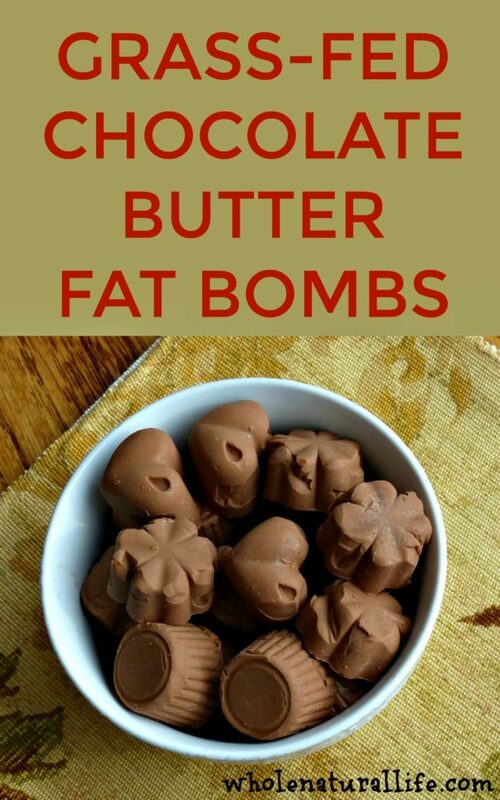 Be sure to also check out my other recipes for healthy fat bombs, like cinnamon butter bites, grass-fed butter mints, coconut oil mints, and lemon coconut fat bombs. Meghan, I'm not in the habit of eating butter, but I love the idea of this inside a fresh muffin--pumpkin and chocolate go so nicely together in a muffin, and chocolate butter melting into the nooks and crannies would be yummy. Thanks! Hi! These sound delicious! Alternatively, if you're dairy free you could probably try this with coconut oil. But it melts at a pretty low temperature, so you would want to store them in the refrigerator. I make these all the time, but I use a bit of peppermint essential oil instead of vanilla. I pop a couple between massage clients for longer lasting, slower burning energy through the day. Did I mention that I lost 70 pounds over the last year while eating these? When I try to pin this recipe, it just takes me to a mobile version of your website. It won't pin the individual recipe. Hmm. I'm not having that problem. Can you tell me where exactly you're clicking, so I can try to replicate the issue? My candy molds are roughly 1/2 tablespoon each. The entire recipe probably makes over 60 of my molds. I used Kerry-Gold grass-fed salted butter, Hershey's Cocoa powder, vanilla extract without glucose additives, and Truvia Nectar for the honey/sweetner (1/2 tsp = 10 calories, 2g carbs=2g sugar, I put 2&1/2 tablespoons per the conversion directions.) The carbs and calories in the cocoa powder and honey substitute seem to be so minimal when spread out over a 1lb of butter divided, that maybe they can be ignored if you're not a super stickler. Will organic granular stevia work as the sweetener in place of the raw honey? Thank you. Definitely! Just add stevia to taste. Hi! How many bombs does this recipe make? New to keto and trying to find healthy ways to increase my fat intake. Thank you! Absolutely love this idea! Perfect for my kids who are always clamoring for "chocolate"
Would it be possible to substitute stevia drops for the honey? Truvia Nectar is a honey-based stevia substitute! Its very good.